This blog post offers some intermediate level heat pipe design guidance for the most prevalent types of electronics applications: mobile to embedded computing and server type applications with power ranging from 15-150 watts using processor die sizes of between 10x10mm to 30x30mm. I’m using these constraints because throughout the article I’ll mention some simple tips or guidelines that don’t necessarily apply when talking about power electronics applications. I’ll also be focusing on the most ubiquitous type of heat pipe – copper tube with sintered copper wick using water as the working fluid. As you might have read in past blogs, heat pipes should be considered when the thermal design is conduction limited or when non-thermal goals such as weight can’t be achieved with other materials such as solid aluminum and/or copper. So, if you’re too the point where heat pipes may be an option, keep the following things in mind. Regularly published heat pipe thermal conductivity range from 10,000 to 100,000 W/mK. That’s up to about 250 times that of solid copper and 500 times that of solid aluminum. But don’t count on those figures for typical electronics applications. Unlike solid metal, the effective thermal conductivity of copper heat pipes varies tremendously with heat pipe length, and to a lesser degree with other factors. Figure 1 illustrates the effect of length on heat pipe thermal conductivity. In this example, we used three heat pipes to transport heat from a 75 watt power source. While thermal conductivity of 10,000 W/mK is achieved at just under 100mm heat pipe length, a 200mm length has less than one-third the typically published maximum thermal conductivity of 100,000 w/mK. Performance data for heat pipes are usually of the Honda Accord variety: adequate for most things, but horrible if you have a specific purpose in mind – like track racing or off-roading. 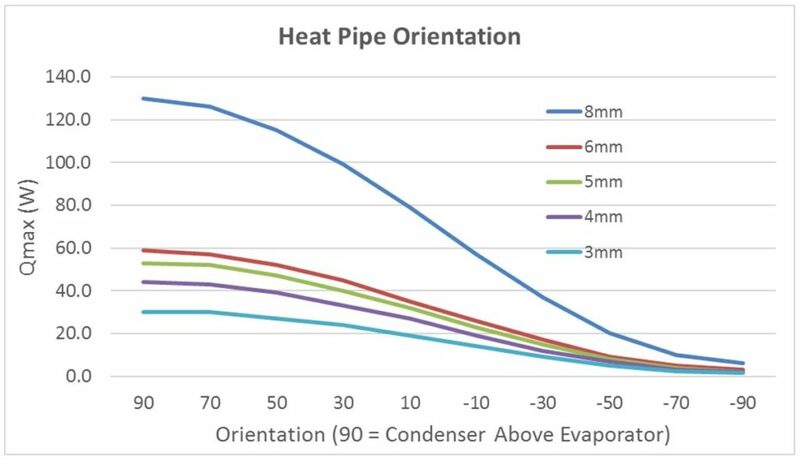 Even when limiting our conversation to copper/water/sintered wick versions, heat pipe customization can markedly affect operational and performance characteristics. And just like cars, design changes to a heat pipe range from the simple to the exotic. As we’ll see later, flattening and bending will negatively affect heat pipe performance but are an easy customization that allow engineers to navigate the often crowded route from the evaporator the condenser. If the application requires lower thermal resistance than a typical heat pipe assembly provides, the heat pipes can be machined to create a flat surface capable of making direct contact with the heat source, eliminating the solid metal base plate and extra TIM layer. A heat pipe whose diameter is different from one end to the other may be needed so that the evaporator end completely covers the heat source while the rest of it remain small enough for tight bends. These changes allow engineers to physically connect the heat pipe to mating components from the heat source to the condenser. But what if the heat pipe still can’t meet power handling or orientation requirements? Changes to the internal structure of the heat pipe design, most notably wick porosity and wick thickness, allow heat pipes to be tuned to meet specific operating parameters and performance characteristics. For instance, when a given diameter heat pipe is required to operate at higher power loads or against gravity, the capillary pressure in the wick needs to increase. For higher Qmax, this means a larger pore radius. For effectively working against gravity (condenser below evaporator), this means a smaller pore radius and/or increased wick thickness. Additionally, it is possible to vary both wick thickness and porosity along the length of a single tube. Suppliers who specialize in heat pipe customization will regularly use custom formulated copper powders and/or unique mandrels to ensure the final product meets applications requirements. Once the internal structure of the heat pipe design has been determined, it’s good to know how outward physical characteristics affect performance. With heat pipes, size generally matters most. However, changes to outward design will degrade performance for any given heat pipe. Figure 2 shows power handing capacities (Qmax) for the most common heat pipe sizes. As noted earlier, Qmax may change amongst vendors for standard (Honda Accord type) heat pipes, but I’m taking some data from recent projects we’ve done – without getting too exotic. Typically, sintered copper heat pipes can be flattened to a maximum of between 30-60% of their original diameter. I know, some will tell you it’s the lower figure before the centerline starts to collapse but it’s really a function of technique – we regularly flatten our one-piece vapor chambers, which begin life as a very large heat pipe, down to 90%+. I wish I could provide a rule of thumb for how much performance will degrade for every 10% decrease in thickness, but it would be irresponsible. Why? The answer comes down to how much excess vapor space is available before the heat pipe is flattened. 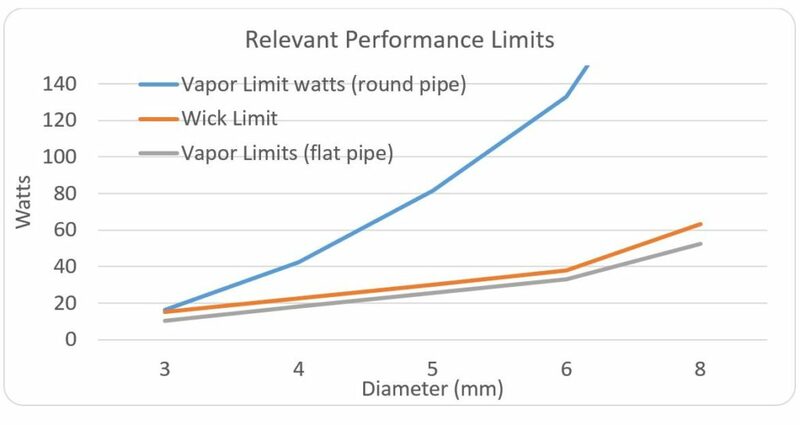 Simply put, there are two performance limits important for terrestrial heat pipe applications: the wick limit and the vapor limit. The wick limit is the ability of the wick to transport water from the condenser back to the evaporator. As mentioned, we can tune the porosity and thickness of the wick to specific applications, allowing for changes to Qmax and/or ability to work against gravity. The vapor limit for a particular application is driven by how much space is available for the vapor to move from the evaporator to the condenser. The orange and blue lines in Figure 3 plot the respective limits for the various heat pipe sizes shown in Figure 2. It’s the lesser of these two limits that determine Qmax and as shown the vapor limit is above the wick limit, albeit only slightly for the 3mm heat pipe. As heat pipes are flattened, the cross sectional area available for vapor to move is gradually reduced, effectively moving the vapor limit down. So long as the vapor limit is above the wick limit, Qmax remains unchanged. In this example, we’ve chosen to flatten the heat pipes to the specifications in Figure 2. As seen by the gray line, the vapor limit is below the wick limit, reducing the Qmax. Flattening the 3mm by a mere 33% causes the vapor limit to become the determining factor whereas we had to flatten the 8mm by over 60% for this to happen. For more technical information on bending both heat pipes and vapor chambers, please visit a past blog on how bending affects heat pipe performance. Let me start this section by saying that we’re using the same fairly ‘standard’ heat pipes that we’ve shown in prior examples so they haven’t been optimized to work against gravity (-90o). Figure 4 illustrates how the relative position of the evaporator to the condenser can affect both Qmax and heat pipe selection. In each case, Qmax is reduced by roughly 95% from one orientation extreme to the next. In situations where the condenser must be place below the evaporator, we would use a sintered material that allowed for smaller pore radius and/or increase the wick thickness. For instance, if we optimized the 8mm heat pipe for use against gravity (-90o), we could raise its Qmax from 6W to 25W. Try out our heat pipe performance calculator here. 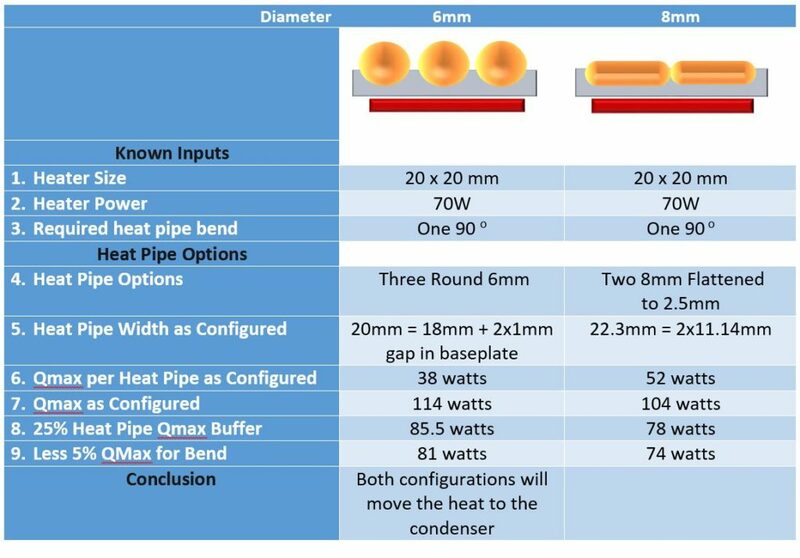 Let’s use an example to illustrate how different heat pipe designs might be used to solve a thermal challenge. Assume the following as know constraints: 70W heat source with dimensions 20 x 20mm and a single 90 degree heat pipe bend required to transport heat from evaporator to condenser. Further, the heat pipes will operate in a horizontal position. To be at their most effective, heat pipes need to fully cover the heat source, which in this case is 20mm wide. From Figure 2, it appears we have two choices: three round 6mm pipes or two flattened 8mm pipes. Remember the three 6mm configuration will be placed in a mounting block with 1-2mm between the heat pipes. Now we need to factor in bending. A 90 degree bend will cause Qmax of each configuration to be reduced by another 5%. The resulting Qmax for the 6mm configuration is now just over 81W and for the 8mm configuration it’s now 74W, both of which are higher than the 70W heat source we’re trying to cool. As can be seen, both heat pipe design configurations are adequate to move heat from the evaporator to the condenser. So why choose one over the other? From a mechanical perspective it may simply come down to heat sink stack height at the evaporator. As you can see, the 8mm configuration has a much lower profile than does the 6mm configuration. Conversely, condenser efficiency may be improved by having heat input in three locations versus two locations, necessitating the use of the 6mm configuration. Please check back for Part 2 of this blog where I’ll be discussing condenser types and sizing as well as methods to attach the heat pipe assembly to the heat source.